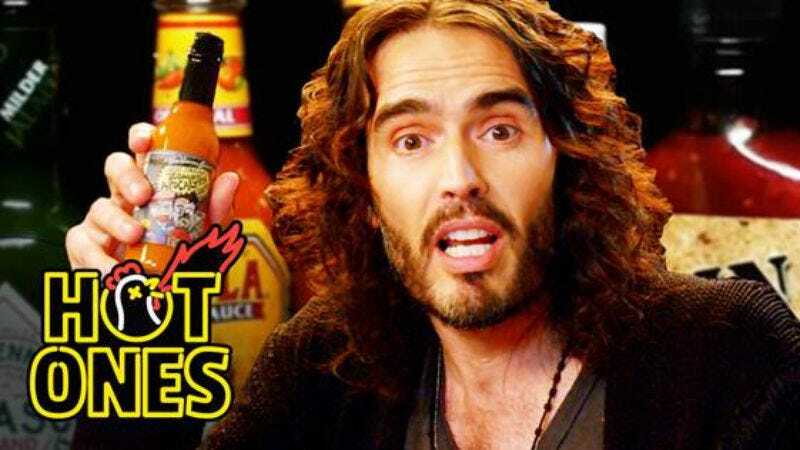 If you peruse the Akashic record made up of our Twitter timelines or watch the Trews, you’d think there was no love lost between Donald Trump and British comic and actor Russell Brand. Trump trashed Brand‘s stand-up nearly three years ago, while Brand has examined the rise of nationalism since the former reality-show host first announced his presidential bid. That may be the case today, but there was a time when Trump was so eager to impress Brand that he basically offered him Muhammad Ali’s heavyweight championship belt. The comedian tells First We Feast’s Sean Evans the story of being invited up to Trump Tower while dining on vegan wings in this Hot Ones clip the A.V. Club is exclusively premiering. Brand does more jawing than chewing in this clip, which might be why he doesn’t end up in tears over his spicy meal. But maybe the capsicum gets the best of him at some other point in the show.